A crocodile display at the Darwin Museum and Art Gallery was presented during 2009 to help celebrate the Origin of Species published by Charles Darwin 150 years ago. This exhibition was part of the worldwide activity surrounding the 200th anniversary of Charles Darwin's birth. 2009 was also the 150th anniversary of the publication of his work "On the Origin of Species". Fossil display- World's biggest Crocodile ever. Arts and Museums Minister Alison Anderson said "This exhibition gives visitors the chance to come face to face with the massive skull of the supercroc, or Sarcosuchus Imperator, which at its full length measured between 12 and 15 metres, and was one of the biggest crocs known to have ever existed." The survival of these animals - the last cold-blooded survivors of the Archosauria, or ruling lizards group that originated alongside dinosaurs more than 200 million years ago - is often cited as a good example of Darwin's theory of evolution. Crocs are part of life for people living in modern Darwin. They provide an important part of the tourist industry and are farmed for their meat and skins. Swimming is out of the question in many of the NT's rivers and beaches because of the dangers of crocodile attacks. Traps are set in populated areas to minimize croc numbers, usually about 200 are trapped and removed from Darwin Harbour each year. 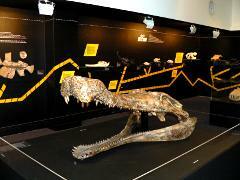 The Darwin Museum has a permanent crocodile display of bones, facts, photos and information. The croc in the photo was famous for attacking local outboard motors and now forms part of this display. To visit crocodiles in their natural habitat see Darwin Crocodile tours. 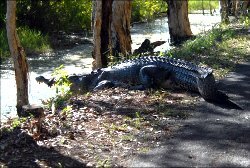 This crocodile was recently photographed at Fogg Dam, a popular tourist destination. Mr Hannond, of Stuart Park, said the saltie was sitting only two metres from where he stopped his car. "I've never ever seen a croc that size out of the water," he said. "I didn't get out of the car. But to sit there that close you know why you wouldn't have a chance in the world against him. It's the ultimate killing machine. "He would be the king of the swamp out there." More pictures of adult crocodiles. Return from Crocodile Display to Enjoy Darwin.